Amal Fikry is the driving force behind the organisation’s chamber orchestra for visually impaired women, who have traveled the world with their music. It is all but impossible to talk about Amal Fikry outside her role as vice-chair of the Al-Nour Wal Amal Association — the main dynamo of the Al-Nour Wal Amal Chamber Orchestra. Conversations with Fikry always lead back to the history and growth of this unique orchestra, consisting exclusively of visually impaired women. It is very obvious that her heart is in nothing but the orchestra, which over decades has become her second family, about which she always talks with genuine love, warmth and pride. “I don’t like to talk about myself,” Fikry replies when asked to allow us into her life. The bits and pieces she does reveal, however, unveil a woman filled with passion, well travelled, but dedicated above all to her two families. All of these elements are equally vital to the satisfaction that nurtures Fikry’s positive spirit. The Al-Nour Wal Amal music institute was founded in 1961 as part of the eponymous association established by the late Istiklal Radi in 1954 aiming to educate and integrate into society visually impaired girls. With support from the late Samha El-Khouly, then dean of the Cairo Conservatory, the institute provided an academic music curriculum transcribed to Braille, with professors from the Cairo Conservatory and the College of Music Education at Helwan University. This soon led to the formation of the first small orchestra, trained and conducted by the late Ahmed Abul Eid. Today, the orchestra is under the artistic supervision of Ines Abdel-Daim, chairperson of the Cairo Opera House, and is conducted and trained by Aly Osman. Bit by bit, Fikry found herself a place within the association and, through her contacts, she managed to arrange the first concert of Al-Nour Wal Amal — then consisting of 15 girls — on the stage of the Old (Khedival) Opera House. “This is when I got more involved in the work of the association while the orchestra started becoming particularly close to my heart.” Fikry’s belief in the values that the orchestra presented paralleled her skills in public relations, opening many doors for the musicians. Al-Nour Wal Amal performances expanded to schools, clubs, embassies and many other locations across Cairo. But this did not seem enough, and another passion of Fikry’s began to surface: the globe-trotting urge. “I’ve always loved to travel and I am definitely privileged to have been able to visit dozens of countries around the world, many of them several times,” she comments. Fikry’s father was a banker and she already travelled a lot with her parents. Later she brought her love of travel to her own family. Together with her husband and three children, the family would spend every summer holiday exploring the world, sightseeing. “At times I would also embark on trips by myself or with the children only,” Fikry adds, pointing to Zurich, Switzerland as one her favourite places, so much so that she calls it her “second home”. In 1988, the orchestra made its first international appearance in Vienna, Austria. “The acclaim was unbelievable. ‘The fourth pyramid of Giza’ and ‘human miracle’ were among the praises received in the Austrian press,” Fikry recalls. This was only the beginning of a series of tours. According to Fikry, to date, the orchestra has performed across all five continents and visited dozens of countries. All of these travels are a direct result of Fikry’s hard work, public relations, promotion of the orchestra and association’s activities and unshakable belief in the blind musicians. “Music is what gives those girls purpose and a sense of self-worth. They also explore the wonderful values that music carries,” Fikry comments. While Fikry enjoys listening to music herself, she recognised that for the visually impaired it is also an important outlet for expression. “I always listened to Western classical music. Many years ago, attending concerts and operas was part of my lifestyle. I listen to many Western compositions; Chopin is definitely one of my favourite composers.” On the other hand, Fikry enjoys Egypt’s musical riches and speaks with admiration of Om Kolthoum. 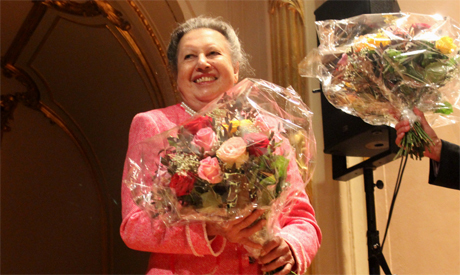 Though Al-Nour Wal Amal’s repertoire consists mostly of Western classical music, the orchestra also includes Egyptian and Arab compositions in their programme. “Travelling allows one to know other cultures, and personally I also enjoy visiting the museums,” Fikry points to the Louvre in Paris, the Metropolitan Museum of Art in New York, and the many museums she visited with her family in London, Chicago, Italy, Spain and endless other countries. During her last visit to Berlin with Al-Nour Wal Amal Chamber Orchestra, Fikry’s schedule started with the Neues Museum, housing the bust of Nefertiti. In fact, a few minutes with Nefertiti has become a tradition whenever international endeavours direct Fikry to Berlin. 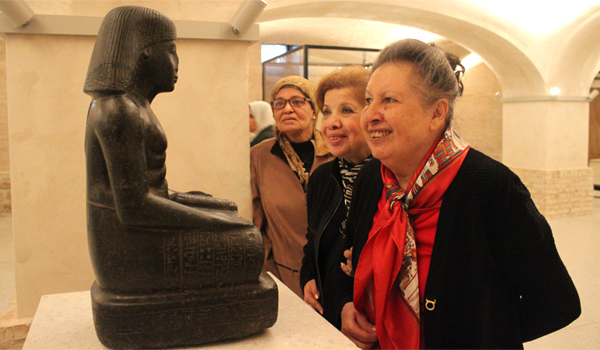 This time she was joined by the orchestra: the visually impaired girls and women had a chance, for the first time in their lives, to touch the bronze replica of Nefertiti’s bust placed in the same room, accompanied by a description in Braille. It is hard to grasp all the wonderful experiences that Al-Nour Wal Amal Chamber Orchestra have had on their travels: personal development joined with recognition, praise and standing ovations… Despite her age, Fikry remains astonishingly dynamic. Today she is surrounded by a team supporting her, and her daughter Hala, who is also on the association’s board, executes a large portion of the organisational tasks. Fikry, however, remains the heart of the orchestra, loved and respected by all. “Amal Fikry loves us and we feel it,” comments Shahinaz Salah, double bass player at Al-Nour Wal Amal. “She treats us all equally and with great respect. She takes care of us as musicians and as humans.” Leader and violin player, Basma Saad, underlines how Fikry always gives the musicians directions, whether on their professional or personal paths. “We enjoy music, learning and performing; we love travelling. But we are also taught about the responsibility that our profession requires,” Saad comments. All musicians at the orchestra and other members of Al-Nour Wal Amal use only superlatives to describe Fikry’s spirit and involvement in the association and her particular commitment to the orchestra. Dedicated, loving, supportive, caring, encouraging, confidential, trustworthy are among the adjectives that recur in their comments. Nagat Radwan Mostafa, the music institute’s executive secretary, adds a long list of events in which Fikry has supported the girls outside their commitments within the association. At the same time, the remarkably strong bond that has developed between the orchestral members and Fikry is obvious every step of the way. It shows when the girls incessantly chit-chat in the bus taking them to a concert hall, when their bubbling conversations with Fikry are met with patience and understanding, how distressed they become when they realise they have challenged that patience with their sporadic youthful follies, and how the girls calm down when listening to Fikry’s advice. Al-Nour Wal Amal Music Institute also gives the girls an academic grounding, with Osman providing priceless training and conducting the orchestra, while a large team supports the girls at the logistical level. However, Fikry is the dynamo and the heart moving the wheel. Her humility and energy are as overwhelming as the music emerging from the instruments of the blind women. While being very proud of the orchestra’s achievements and speaking tenderly of each musician individually, Fikry’s modesty continuously omits pointing to her own inimitable achievement. Today we see the palpable fruits of her many years of hard work and diligence, topped with the belief that she can improve life for these visually impaired women — and what an achievement.